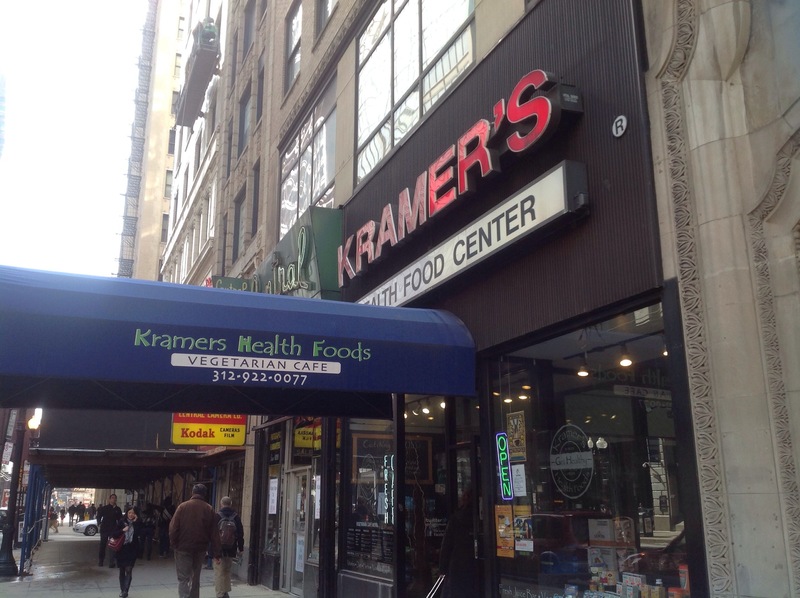 Kramer’s Health Foods is located at 230 S Wabash Ave. To get to the cafe you have to first walk through the shop to the back. 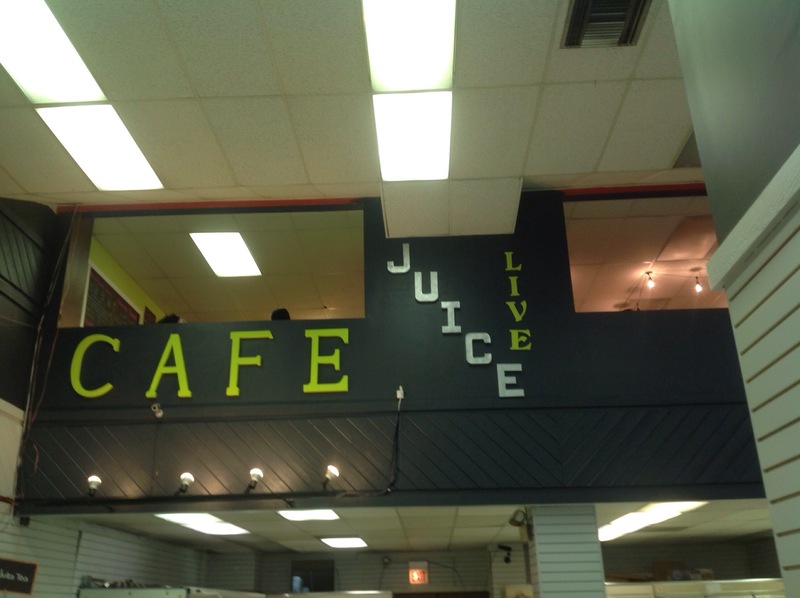 They sell a variety of teas and foods and all natural products. The cafe is in the back. There are stairs leading up. They also have a menu in the front window so you can look at their options. However they do have a soup of the day and more options in the actual cafe. I ordered the big ham panini which is vegan ham, caramelized onion, cheddar and dijon mustard. When I ordered it they asked whether I wanted vegan cheese or dairy, I picked dairy. I also asked for a tropical shake which is pineapple juice, coconut milk, banana’s and ice cream. I was surprised when the person who took my order handed me a card and walked away, until I saw the sign that said you take your receipt downstairs to pay. So you pay at the cashier at the front of the shop, that’s also where you would tip if you wanted. It fluctuates in busyness. At noon it wasn’t very full but halfway through my meal I noticed more people waiting to order. I’ve never had vegan ham before or really any vegan meats. I enjoyed my panini. The vegan ham was very spiced, so it had lots of flavor and was slightly sweet. The cafe was rather warm, pleasantly so if I hadn’t gone on one of the warmer days of the year. 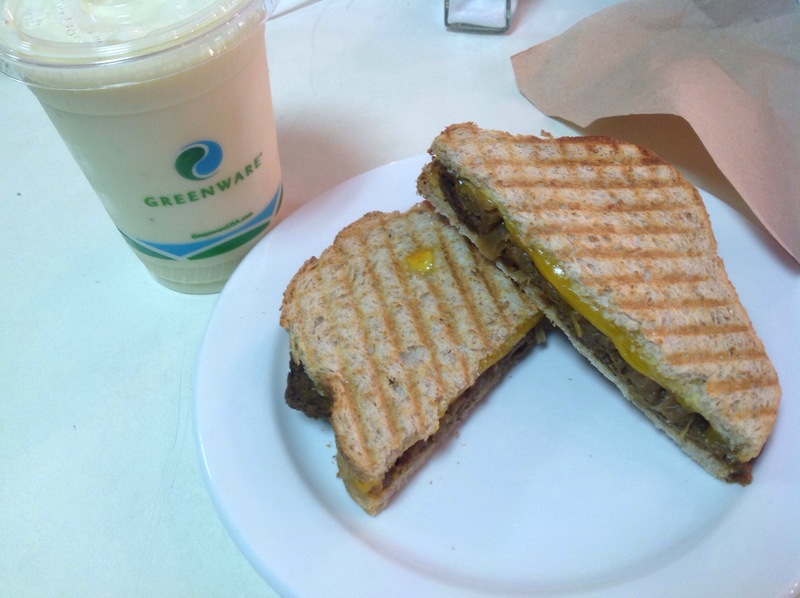 I ended up not being very hungry and I’m unsure whether that was the warmth, if the panini with the shake was just that filling or something else. They also have a section by where you order and pick up, where you can get water or oyster crackers for your soup. It’s a nice place to go to get something healthy and everything has a vegan option which is nice.